Verderflex releases another peristaltic pumping innovation: the new Dura 45, which defines the benchmark for the next generation of medium flow, industrial hose pumps, with 25% more flow per revolution in a more compact package than its competitors, with the added benefit of stalled rotor protection and a patented easy change hose connection. Verderflex’s compact Rapide tube pump family is the ideal solution for low pressure industrial process pumping: easily used with inverters and interfaced with external control systems, they have an industrial gearbox and an easy access tube pump head that combine to form a simple, cost effective industrial pumping solution without the complexity of cased drive tube pumps. The Scientific and Smart ranges provide a sophisticated group of easy to use, stand alone low pressure dosing and dispensing solutions. With easy access heads that allow tube changes in seconds, they can be controlled by external devices for metering duties or can be programmed to precisely dispense measured doses of liquids. Every machine builder has a unique set of pumping requirements, imposing widely differing equipment demands solved by Verderflex’s comprehensive range of OEM pump heads. Each model can use several tube materials and can be AC or DC powered to solve a wide flow rate range of pumping problems. 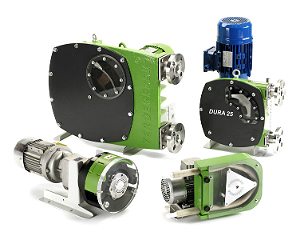 Verderair VA double diaphragm pumps are available in a wide range of materials and material combinations. The pumps deliver a flow up to 1200 l/min and have a max. pressure of 16 bar. The robust design ensures long quality life and short maintenance downtime. Verderair diaphragm pumps are executed with a non-stalling air valve and are non-icing. The new Verderair Pure solid machined diaphragm pumps (pure PE and PTFE) offer solutions for high end applications.Conductive PE and PTFE are available for ATEX environments and feature a lot of accessories, such as pulsation dampeners, barrier systems and more. The Verderair diaphragm pumps are the most efficient diaphragm pumps because of its unique air valve design.